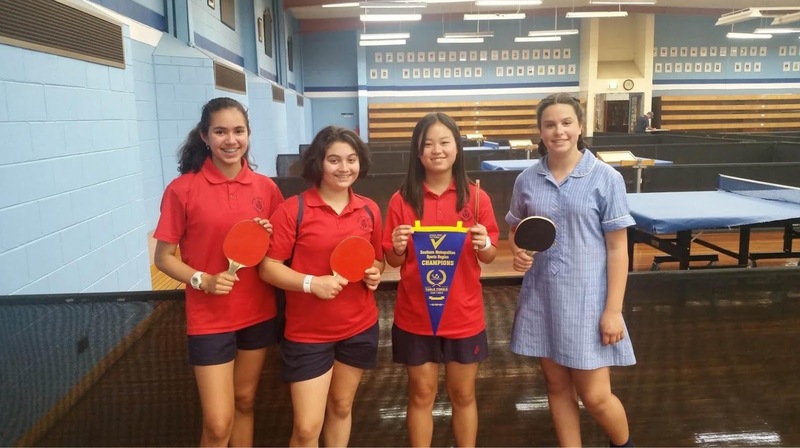 Congratulations to the Year 7 Girls Table Tennis team, consisting of Azumi Hosako, Alessia Frantzis, Valeria Camacho Acevedo and Amy Wilkins, for representing McKinnon Secondary College at the Table Tennis SMR Finals that were held on Thursday 1 November at the Dandenong Oasis Table Tennis Centre. In order to qualify for the Finals, the girls had to contest a Preliminary Final against Kambrya College, which they won four matches to two. In the Round Robin pool stage, the girls beat McClelland College six matches to nil in the first round. They then won their second round contest, before beating Rosebud Secondary College six matches to nil in the third round. This placed the girls first in their pool and set up a Semi-Final showdown, which they won. They then went on to win the final four matches to two, to qualify for the State Finals which will be held on Wednesday 21 November at the Melbourne Sports and Aquatic Centre.